"The Best of Cavalier Attitude" is my thirty-seventh book and my fourth compilation supplement. This book combines the very best of the first two volumes (Volume I and II) of Cavalier Attitude, for a content-rich, reasonably price summary of the crème de la crème of Cavalier Attitude's first two years of publishing! This 56 page compilation supplement contains FIVE OSR ADVENTURES, SIX RPG ARTICLES, and a FANTASY SHORT STORY! The supplement also provides NEW CONTENT in the form of a new mini-adventure as well as all the DUNGEON AND OVERLAND MAPS needed, new PRE-GENERATED CHARACTERS, NEW MONSTERS, and NEW MAGIC ITEMS! A world of adventure awaits you within! 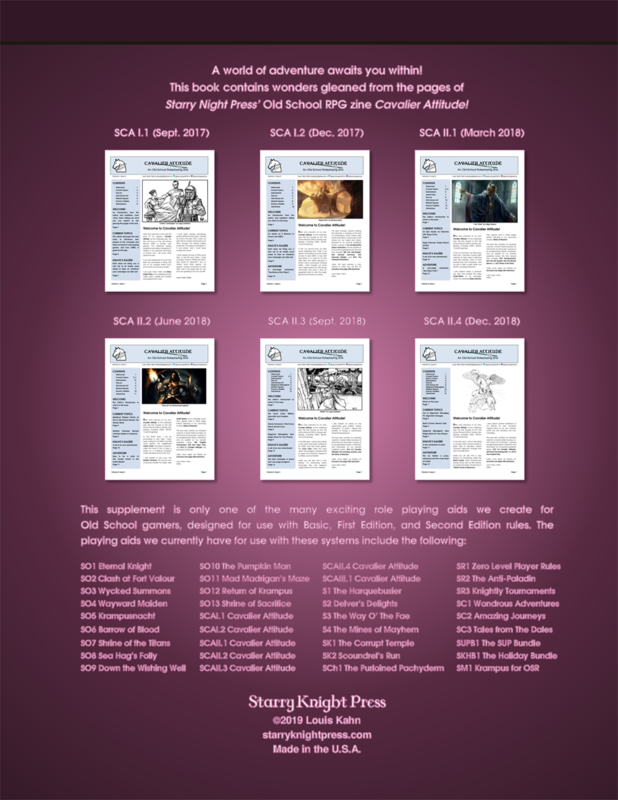 Starry Night Press’ Old School RPG zine Cavalier Attitude! This supplement was inspired by the venerable TSR “Best of Dragon” series. 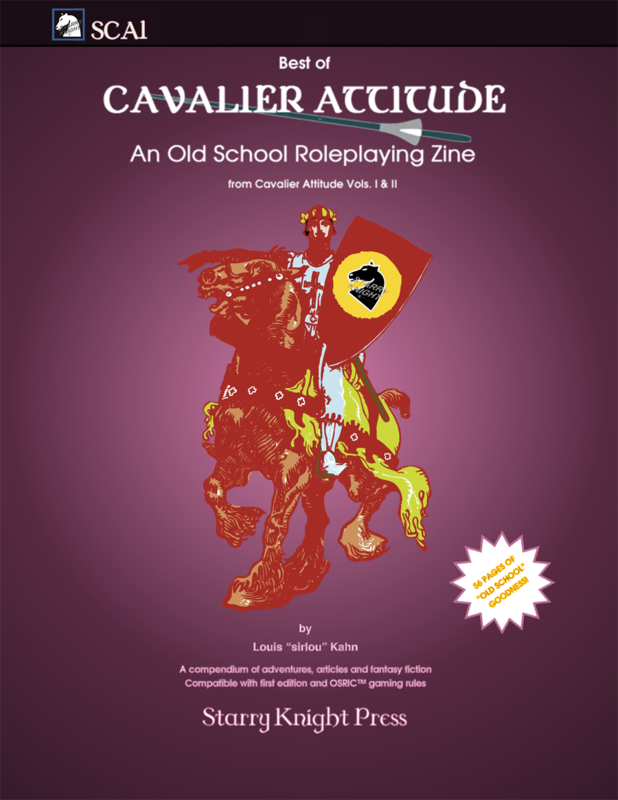 In this supplement you will find adventures, RPG articles, and fantasy fiction all gleaned from the first two years (Volumes I and II) of my Old School zine, CAVALIER ATTITUDE! 56 pages of OSR goodness featuring adventures scenarios, RPG articles, short fantasy fiction, and much more! INTRODUCING PLAYERS TO RPGS VIA OSR: In this article we discuss the efficacy of using OSR games to introduce new players to role-playing games, including those who have never played before. 8 REASONS TO CHECK OUT OSRIC: This article provides an explanation of what OSRIC is, and why I think it might be the very best of the Old School Renaissance retro-clones. HANDY HAVERSACK: What items should every adventurer have in their backpack? We answer this question by offering a “standard pack” to allow players to meet all of an adventuring life’s uncertainties, with a breakdown of our pack’s contents and the use and necessity of each item. THE WARRIOR MONK: This article introduces a new playable class for OSRIC, a warrior monk based on Western European-style medieval monks. THE SCOUT CLASS: This article discusses a new playable class for OSRIC, the scout class: a class composed of lightly armed military spies, dogged bounty hunters, and bold frontier people. OUT OF ALIGNMENT: A discussion on when and how a player’s alignment may change, the consequences of this monumental shift in the player’s ethos, and how to handle this issue as a Game Master. SIENNA’S TALE: DEATH COMES TO BLACKROCK: In this story we meet the brave, inquisitive girl Sienna, on possibly the worst day of her young life. From seemingly out of nowhere, cruel Oruks attack her family farm, taking everyone and everything that matters to her. But they cannot break her spirit! This book serves up 56 pages of action and excitement, and it is sure to please discerning GMs and players everywhere!